Drug use is widely understood in terms of its subjects, substances and settings. But what happens when these distinctions start to blur? Injecting Bodies in More-than-Human Worlds moves away from a hierarchical conceptualisation of drug use based on its subjects and their objects, offering unique and fresh insights into the complex world of injecting drugs. Focussing on the Deleuzian notion of bodies-in-process, Dennis proposes a new and timely approach to drugs where agency materialises in relation to others – human and not. Using rich, ethnographic data to demonstrate bodies’ in/capacities to act through their relationality, Dennis carefully maps out where bodies are thought, practised, lived and intervened-with: caught in tension between pleasure and addiction, activity and passivity, ‘becoming-other’ and ‘becoming-blocked’, and making and breaking habits. 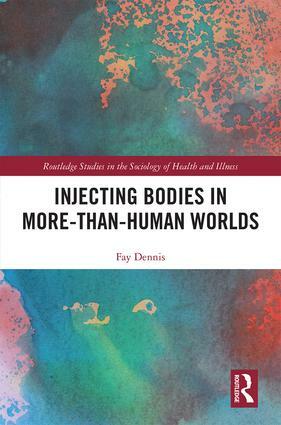 Arguing for a deeper engagement both with how bodies are enacted and with our collective responsibility to bring them together in healthier ways, this volume offers a unique intervention into the sociology of drugs and, more widely, health and illness. It will appeal to students and researchers interested in fields such as Science and Technology Studies, Sociology and Social Policy, Drugs and Addiction, and Health and Medical Anthropology. How should drugs, pleasures, harms and problems be interrogated in the more-than-human worlds of affects, signs, technologies and bodies that dominate contemporary life in the Anthropocene? Dennis’ timely new book leads the reader through these worlds, abandoning the verities of subjectivity, control and rationality in favour of a far more mysterious account of assemblages, affects and pleasures, health and becoming. The result is a powerful new vision of social science, and a compelling new model of harm reduction for the more-than-human to come. How do we do injecting bodies? And how can we do them better? Inventing new methods and concepts to address harm reduction from within, Fay Dennis develops an alternative methodological approach to doing social scientific drugs research, thinking with drug use and engaging drug treatment and policy. The contribution of this path-breaking research lies with its capacity to bring the habits, pleasures and contexts of drug users experience into presence, so that we can learn from them and transform the lives of drug users. Injecting Bodies in More-than-Human Worlds breathes new life into an important area of health research that has been overshadowed by a discourse of addiction and dependency. Dennis’ book makes an exciting and accessible contribution to the field of Critical Drug Studies, and should be essential reading for students and academics interested in fostering more rigorous and ethically responsible interventions and practices of knowledge-production around drug use. Bringing creative qualitative research into connection with post-structural and post-humanist concepts drawn from the work of Deleuze and Guattari and the fields of STS and New Materialisms, Dennis shows clearly the urgency and importance of developing more complex understandings of drugs, drug-using bodies and drug-related effects. Conclusion: Empowering bodies: Making bodies better? Fay Dennis is a Wellcome Trust Research Fellow in Social Science and Bioethics in the Department of Sociology at Goldsmiths, University of London.